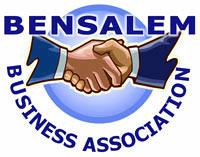 HOW TO JOIN THE BBA: To become a member of the Bensalem Business Association you can attend the next scheduled meeting and complete a membership form there or fill out the membership form below and mail a business check to the BBA with dues of $120. If you have any questions in reference to membership please don’t hesitate to contact any BBA board member. Are you a new business owner in Bensalem? We would like to help you out. We at the Bensalem Business Association know firsthand what the first year in business feels like, as we are business owners ourselves. To help, we offer any new business in Bensalem a FREE membership to our organization for the remainder of the membership year. Call us for more information. Applications for membership shall be subject to approval of the Board of Directors, and subject to Section 11.2 of the By-Laws relative to immoral, unethical and illegal business practices. Please note: YOU MUST COMPLETE THIS FORM TO BECOME A MEMBER however this form does not register you as a member until your membership fee has been posted. Please complete all sections and check details before submitting as this information will be what will appear in the BBA directory.